What separates the famous chess games of the romantic era and the modern era from the millions of games that get played over the years? Chess is like any other human pursuit. When you see people excel in their discipline and perform insane feats you have to stand back and admire it. Our potential and capabilities vary from person to person. You have the pack where most of us are. You have smaller groups at higher levels who are more gifted than most. And then you have the elite, a special club who through their own remarkable genius stand out from everyone. Great painters fill museums with incredible works of art. We refer to their greatest paintings as masterpieces. Chess grandmasters also leave behind works of art at which we can only marvel. Their greatest games are also called masterpieces. 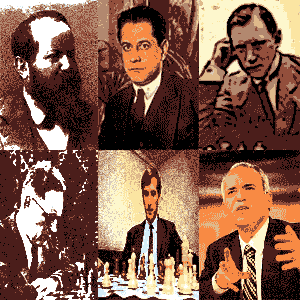 I invite you to enjoy 32 of the greatest masterpieces in chess history. You can also add articles and games of your own. We start with the French legend, Philidor followed by his compatriot Labourdannais. Morphy and Anderssen arrive next with Steinitz and Lasker soon after. Rubinstein, Capablanca and Marshall show us how to play the game. Alekhine, Reti and Bogoljubov also have their say. Botvinnik, Tal, Fischer and Spassky then pick up the baton. We come to more recent years as we hit the home stretch. Karpov and Kasparov are next to assume the mantle before handing over to their successors. Anand and Topalov bring proceedings to a close. Two players from among our current standard bearers. The chess games are annotated to provide some strategic insight for you. Enjoy. We have listed 32 of the most amazing games ever played right here. But no matter how many are listed, inevitably there are many other beauties that do not make the cut. You might think to yourself, 'oh I know a game that should have been in there'. Well don't keep to yourself. Write an article on it. Annotate it move by move. You could annotate one of the games on this page if you like. Give us your take on it with either an article or annotated game. What is the most famous chess game ever? Your article will appear on a Web page exactly the way you enter it here. You can wrap a word in square brackets to make it appear bold. For example [my article] would show as my article on the Web page containing your story. Some of the greatest chess players ever. Awesome combinations and at times strategy to deep for mere mortals to comprehend at first or even second glance. These games will live forever, coming to life on our screens every time we play through them. One can only imagine the chess masterpieces that are yet to be played. With more players than ever, the standard ever rising, what gems lay ahead? Even in the silicon age there is still room for sparkling combinations. Those double exclamation marks!! With clocks ticking and furrowed brows sporting beads of sweat, chess is still a pressure test. Games will always hinge on human wit. Having just witnessed the work of some of the brightest chess minds let's turn our attention to the prize they covet the most. The World Chess Championship has an interesting history. This link takes you from Famous Chess Games back to your Homepage. Your Homepage is where you get a site overview. There you can see all of the resources on offer in this web site.